Forecast to Register a Robust CAGR of 13.3%, Natural H. pluvialis Algae Astaxanthin to Drive Global Astaxanthin Market to Reach US$770 Million by 2024 – Market Report (2017-2024) by Industry Experts, Inc.
Industry Experts, Inc. published an updated 2018 version of the exclusive comprehensive global market report on Astaxanthin. The new report entitled “Global Astaxanthin Market – Sources, Technologies and Applications” reveals that the global market for Astaxanthin is forecast to cross 360 metric tons in 2018. The report reviews, analyses and projects the Astaxanthin market for the period 2014-2024 globally, and the regional markets including North America, Europe, Asia-Pacific, South America and Rest of World. The market is illustrated broadly by major countries in North America – the United States, Canada and Mexico; Europe – Norway, the United Kingdom and Rest of Europe; Japan; Asia-Pacific – China, Australia & New Zealand and Rest of Asia-Pacific. Astaxanthin products analyzed in this study include Synthetic Astaxanthin, Haematococcus pluvialis Microalgae Astaxanthin and Astaxanthin-rich Paracoccus bacteria. End-use application markets covered in the report are Aqua & Animal Feed, Nutraceuticals, Cosmetics and Food & Beverages. 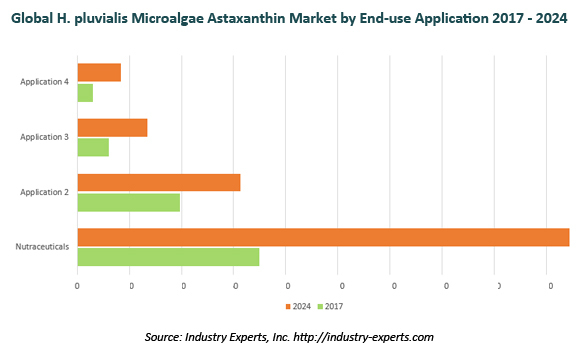 The report also provides a special focus on various astaxanthin production technologies employed by key market players, including Chemical Synthesis; Microalgae Cultivation, Harvesting, Drying and Astaxanthin Extraction; and Bacteria Fermentation. This 292 page global astaxanthin market report includes 128 charts (includes a data table and graphical representation for each table), supported with meaningful and easy to understand graphical presentation, of the market numbers. This report profiles 54 key market players segmented by synthetic astaxanthin manufacturers – 6; natural source astaxanthin manufacturers including subsidiaries – 38; and algae astaxanthin technology & equipment providers – 10. The report also provides the listing of the companies engaged in research & development, manufacturing and supply of astaxanthin, as well as technology and equipment providers. The global list of companies covers the address, contact numbers and the website addresses of 63 companies.